What you're about to learn might completely change your outlook on life and more importantly your outlook on girls and how to interact with them. What many people fail to realize is that we live in a world that is governed by a social hierarchy. This system determines where people and groups of people are ranked. Some call it the chain of command or the pecking order but really it's just an unseen ranking system. Everywhere you look this hierarchy is present and all-encompassing. Here's where it gets interesting though. In most cases, it is those individuals or groups in the upper echelon of the system that wield the greatest power. In high school or college, these are the ballplayers the super attractive and the wealthy. From the moment mankind developed a civilized society. The ones at the top have always received the greatest rewards. The ballplayers can pretty much pick and choose whatever girl that they want to be with and the same is true for any famous semi-attractive men. Every single person on the planet is part of this social hierarchy whether they want to be or not. And every person is part of a handful of groups. At the top of the hierarchy, you have the alpha males. Some of these people were born with genetics that allows them to naturally fit into this group but many others develop the traits necessary to become part of the group rather than being born into it. Since the alpha male sits at the top of the chain of command they controlled most of the resources and get first pick when it comes to mates. At the bottom of the hierarchy, you'll find the beta males, these are the nice guys or pushovers or what you might call the weakest males. The defining trait of the beta man is that he is submissive whereas the alpha male is dominant. But hidden within this hierarchy is an entirely different type of male, some might call him the black sheep but this is a good thing. Located close to the top of the social hierarchy is the Sigma male. Many guys reading this article right now are actually part Sigma and may not even realize it until this article is over. The Sigma at his core is like an introverted alpha male rather than being one or the other. The signal is like the Alpha but without all of the weaknesses of the beta male. The most defining trait of the Sigma is mystery and very few people can unravel his personality correctly. So how do you know if you were actually a Sigma male and don't even know it? And why is this important for interacting with girls? The Sigma male is someone who is introverted but dominant. This simply means that they don't like spending as much time around or talking to lots of people. In other words, most of the Sigma males focus is internal rather than external like an extrovert. The Sigma is never influenced by the opinions of others and he defies all expectations of society. This type of male is naturally an over-thinker which allows him to avoid drama easily and gives him a distinct edge and handling most situations. Overthinking the very thing that some would call a weakness is actually the Sigma's greatest strength because it allows him to peel back the layers of every aspect of life or situation allowing him to learn from every mistake and become better stronger and more adaptable. Unlike your typical extrovert the Sigma milk doesn't speak just to speak and he rarely engages in small talk because it's meaningless dan. For this type of man, silence is his natural environment but it's not because it shire submissive it is simply because it's the environment where he operates best. 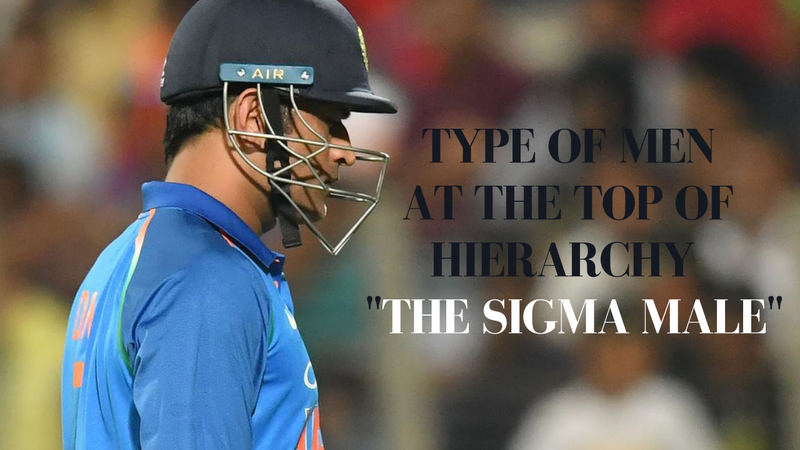 You'll find the Sigma Males at the top of the hierarchy and unlike many of the peer alphas who smashed their way to the top through sheer assertiveness. The Sigma used something just as powerful, intelligence. One of the Sigma's greatest strengths is the natural ability to analyze everything, everyone, and every experience. Allowing him to learn from these things in ways that most people don't. What this type of man lacks of social skills? He makes up for with superior intelligence and this is where it gets interesting when it comes to girls. The Sigma, when viewed by others, sseems extremely mysterious because he's always thinking and doesn't talk much. And if you know anything about girls you know that the one thing that drives girls crazy in a good way is not being able to figure a guy out. As humans, we are naturally curious creatures and in previous articles, you learned that girls in many ways behaved like cats. Let me ask you a question what does the cat do when you first ring at home? It ignores you and walks around to every room of the house. Curiously investigating every square inch. And if there is a route that it cannot unlock it will never rest until it discovers what's hiding behind that door. But as a sigma male girls will never truly discover what's inside your house and this will make them eternally attracted to you. A mystery is something that all girls find irresistible and if you haven't already noticed it is the building block of this entire channel. Sigma males also have no problem breaking the rules of society but only because it's fun for them. If the Sigma male was a car he would be a Nissan GTR because looking at him you would think that he's just an average guy but hiding under the hood is an incredible amount of raw power ready to be unleashed whenever it's needed. Girls have and will always be attracted to the signalman because they literally can't help it. They're like cats endlessly searching his house for that unlocked door but they will never find it. Girls and even guys are attracted to mystery which the Sigma projects naturally. So how can you apply this to your own life? And the answer is simple! I was a sigma male without even realizing it. Extroverted guys viewed by silence as weakness and while their way of interacting with girls worked for them. My silence worked just as well or even better for me. But keep in mind that confidence is the backbone of the Sigma male. So although he's quiet and introverted it is the underlying sense of confidence he has in himself that makes him super attractive and mysterious to girls. Maybe you're naturally a sigma man and if so you've just discovered that you have an incredible gift hiding inside of you. That can make you irresistible to most girls. You are also much higher up in the social hierarchy of this world than people would have you believe. Interacting with girls and winning at this game that we call life is all about playing To Your Strengths and not to your weaknesses. And if you're naturally introverted confident and intelligent then unleashing the Sigma male within you could quite literally change your life and how you're viewed by girls forever. Let me know in the comments section what type of male you think you are? Tags : "all girls are the same" "attraction" "dating" "does she like me" "facts about attraction" "how to" "human attraction facts" "love" "psychology of attraction" "psychology"